First of all, check all around the vehicle. You’ll need to see if the exhaust pipe is clear of snow. If not, clear it by hand. Then move any snow away from around each tyre. Ideally you’ll have a shovel in your car as part of your emergency winter kit but, if not, improvise with whatever’s available. 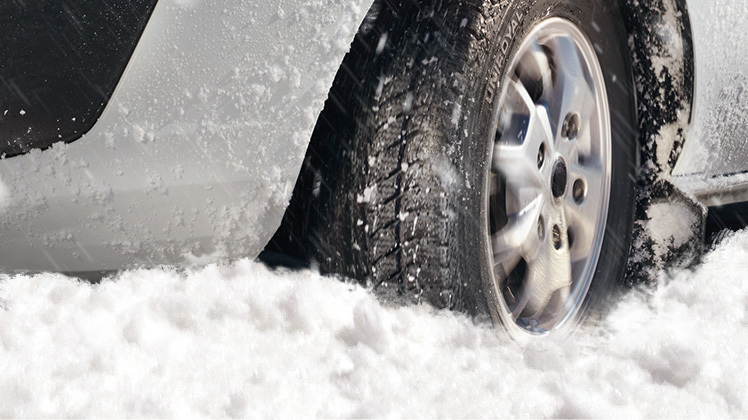 As far as possible, try to break up any ice that’s formed under your tyres. Depending on whether you’re intending to reverse out of the snow, or drive forwards, you will also need to get rid of any snow between your tyres and the exit route. Now start the car. Disengage your traction control system (there’s usually a button for this on the dashboard somewhere) and put the car into the lowest gear. Whatever you do, don’t slam your foot on the accelerator. All this will do is spin your tyres and dig yourself into more trouble. If you’re stuck in snow, you’re going to need to get some help to get you out. While you’re pulling away, slowly, ask one or two people to assist you by rocking the car back and forward to try to get it out of any ruts. Drive with your wheels pointing straight and move back and forth until you have enough grip to pull out. You may have some success, if that fails, by turning your front-wheel drive wheels in a different direction. If that doesn’t work you can try putting some matting down in front of the driving wheels (front wheels on a ‘front-wheel drive’, rear wheels on a ‘rear-wheel drive’). If you can’t get your hands on carpet, you can use your car’s floor mats – although expect them to be ruined. You could also use branches but be aware that anything you put under your tyres could get spun out and potentially hit the people who are trying to help you. Another alternative, if you’re stuck in snow, is to sprinkle salt, sand or even cat litter in front of your driving wheels. The salt will help to melt the ice while the sand/cat litter will help add traction. You can also try to melt the snow and ice with antifreeze but make sure you clear this up afterwards as antifreeze can be very poisonous to animals. You can get more friction by letting a little air out of your tyres. However, only do this if you have the means to re-inflate your tyres afterwards. It will ruin your tyres if you drive on them without sufficient tyre pressure. If all else fails, you will have to call for roadside assistance. And don’t forget to reengage your traction control once you’re back on the road.